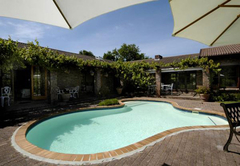 Le Petit Vignoble is a highly recommended Constantia Bed & Breakfast providing accommodation in 5 guest rooms for tourists visiting the Constantia Valley region. 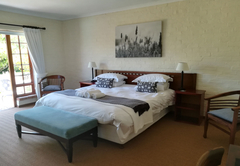 Le Petit Vignoble provides bed and breakfast accommodation in Cape Town in 5 elegantly decorated, en-suite, double rooms all with private entrances. Breakfast is served alfresco or in the dining room. Situated in the historic Constantia valley, Le Petit Vignoble has beautiful uninterrupted views of the Constantiaberg mountains. Christine welcomes her guests to her relaxing and peaceful home. 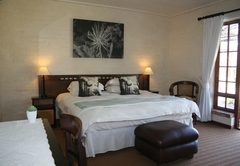 Five double en-suite rooms are simply and elegantly decorated with cool, crisp white linen and contrasting cushions and furniture. Enjoy a pre-breakfast swim in the pool and relax in the evenings on your patio with a sundowner while watching the last rays of the sun disappear behind the mountain. All rooms have private entrances. 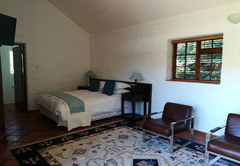 Four of the rooms are overlooking the garden and pool area and have a view of the Constantiaberg Mountains. 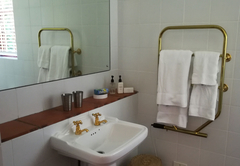 All rooms are equipped with tea and coffee trays, TV, safe, bar fridge, hairdryer, heated towel rail and hot and cold air-conditioning. 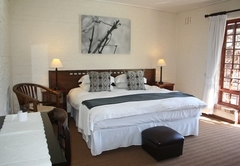 Each room has a king-size bed which can be changed into two singles if requested. The bathrooms all have showers and two also have a bath. Breakfast is served alfresco or in the dining room. Constantia is known for its five historic wine farms, the grande dame being Groot Constantia where a proud wine-making tradition reaches back to the late 1600's. 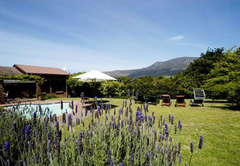 There are many restaurants in close proximity including renowned Constantia Uitsig and Buitenverwachting. Mountain walks and hikes are on our doorstep. Constantia is within easy reach of most of the popular destinations in Cape Town, including Hout Bay, Kalk Bay, the Waterfront and city centre. We again fully enjoyed everything! 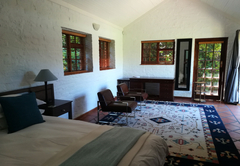 Wonderful location, quiet and comfortable and close to exceptional restaurants, beautiful golf courses, not far from the beach and Cape Town Center. 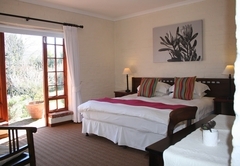 We liked the very nice rooms with everything you need and want, fast internet, great breakfast with e.g. original homemade müsli, and last but not least the perfect host Christine. We'll certainly come again!